Fibromyalgia is a disorder causing musculoskeletal pain in combination with sleep issues, fatigue, memory trouble and mood issues that affect 2 to 5 percent of the people in the United States. It is a complex neuroscience disease. Physical trauma, infection, surgery or a high amount of emotional stress can sometimes trigger symptoms. However, sometimes symptoms gradually accumulate over time with no triggering cause. 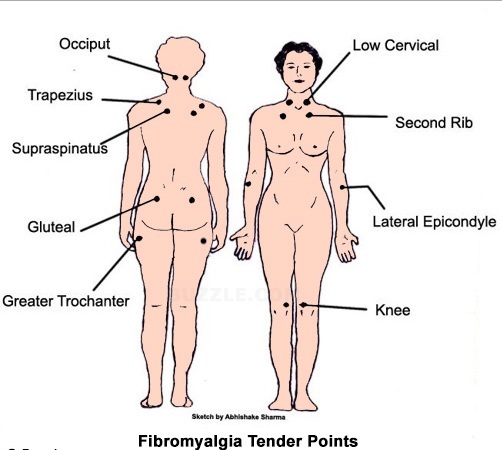 Women tend to be affected by fibromyalgia more often than men are. Common symptoms can include aching, disrupted sleep patterns, fatigue, depression, morning stiffness, bowel or bladder issues, tender lymph nodes, anxiety, sensitivity to heat or cold, dizziness, gastrointestinal disturbances, recurrent headaches, heart palpitations, impaired co-ordination, environmental sensitivity and allergies. Experts believe there are 18 points, or 9 pairs, that are often painful when pressed by a doctor to diagnose this disease. The tender points are at the base of the neck (back), the front of the neck, the shoulders, the inside of the elbows, the knees, the lower back, the upper back, the hips and the chest just a few inches below the collarbone. The American College of Rheumatology guidelines states that people with pain in at least 11 of these points are considered to have this ailment. There currently is no specific test that can accurately diagnose this condition many doctors now believe that performing neurological and metabolic tests are more effective in diagnosing it and finding its cause. In a controlled study conducted by the University of Washington Medicine Sleep Institute, 166 fibromyalgia patients showed more neurological symptoms than were seen in the overall control group. Normally, a doctor would perform an evaluation to find the sources of your pain. Testing follows directly after ruling out physical and psychological causes. Every person’s pain is different. A metabolic panel includes auto-immune evaluations, hormone panels, complete blood panels, immune panels, thyroid panels and adrenal stress index. Integrity of the nervous system will be evaluated by a neurologic evaluation. This evaluation includes autonomic responses, cerebellar function and more. Individuals labeled with the same diagnosis may have different treatments based on the results of these tests. Fibromyalgia treatments come in a few different forms. Neurological treatment is painless and very safe. These treatments include unilateral stimulation (BBT) using auditory, olfactory, visual, tactile stimulation and oxygen therapy. Specific treatments, techniques and approaches are then implemented. Metabolic treatments can include dietary changes or supplements. Changes in dietary habits, such as increasing proteins and decreasing carbohydrates, can greatly improve metabolic symptoms. After many years of misunderstanding this disease, there is help through fibromyalgia treatments for people suffering from this disease. Whether you have suffered for years or were recently diagnosed, you can get rid of your pain through a qualified clinic, like the Broadview Spine & Health Centre (visit Fibromyalgiaottawa.com today).